No, we couldn’t leave well enough alone. 1. 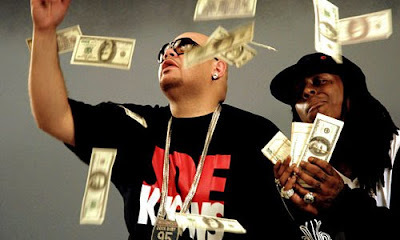 In our very limited experience - limited to rap videos, pretty much - flush-with-paper rappers usually opt to make it rain in nightclubs and strip clubs. But is there any rule that prohibits ballers from making it rain while checking out in the 10 Items Or Less aisle at Wegman’s, during a family summer barbeque, or while undergoing a routine physical? What if the urge to bring the thunder struck you during Sunday service when you realized that the collection plate was just a few parishioners away? Would you heed that call? 3. Is there something one shouts just prior to making it rain, like a warning or announcement or something? Or do you just sort of impulsively hurl dead presidents into the air when the mood strikes you? 4. Have you ever made it rain only to realize that no-one noticed, and that, for all intents and purposes, it never actually happened? 5. Do you ever practice making it rain while alone at home, with Monopoly money? 6. If they can put on a man on the moon, why can’t they invent or biologically engineer a Yves St Laurent branded, Eva Longoria-look-alike fem-bot to throw your money for you while you’re buying out the bar?